Second, put your quartered berries into a heavy-bottom sauce pan over medium heat. Add your sugar and your corn starch. Now, let that mixture cook down to the point where berries start releasing their juices and “sauce” begins to form. Whisk OFTEN. Meanwhile cut your lemon into and juice it. Add that juice to your pan. 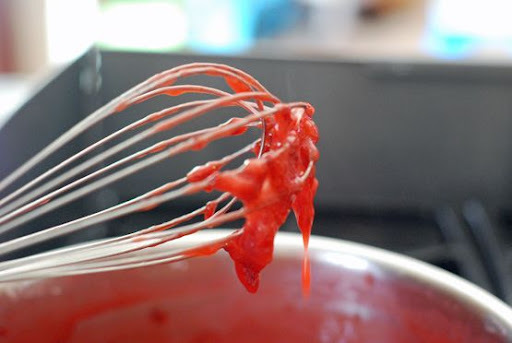 For filling: you’re headed for strawberry pie awesomeness if your sauce sticks to your whisk a bit. If it rolls right off, continue cooking until it reaches that point! Add your halved berries, cook until warmed through. For topping: you’re done cool slightly and serve! 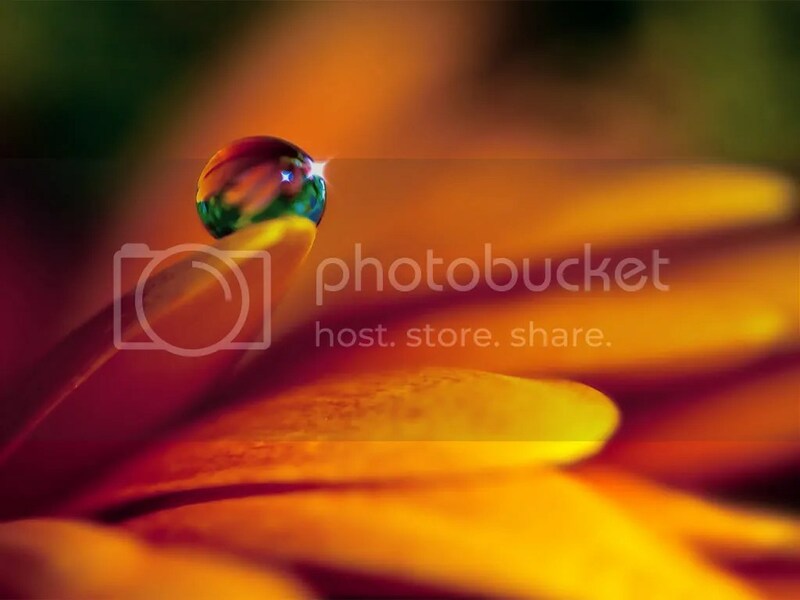 Categories: Friday Fun, recipes | Tags: strawberry sauce | Permalink. This post is really a tribute to my mother who was into alternative health care, herbs and such, way back when it was just plain weird, and who, over the past 3 decades, has collected more books on the subject than she’ll ever read…. Now before we get started, all the usual disclaimers apply here: First, I’m NOT a doctor or any kind of medical professional. Next, I DON’T diagnose or prescribe anything. But, I AM happy to share health information, such as I discover, on topics of interest to readers . Common sense and prayer always apply. If you have a chronic condition, or think you may, see your doctor! The following statements have not been approved by the FDA, but are made under the protection of my 1st Amendment right. 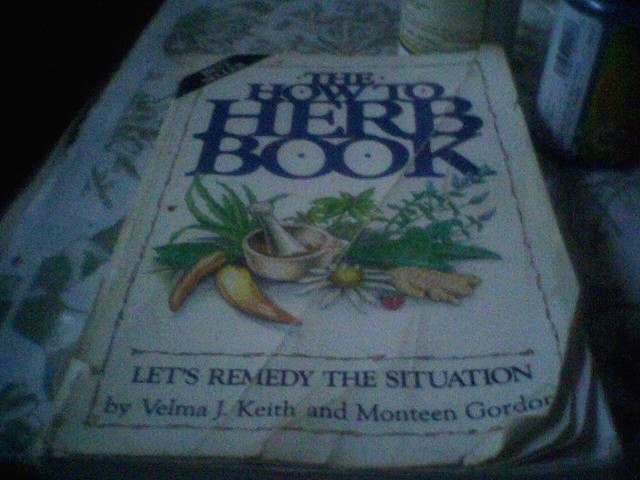 Last summer, I was perusing her bookshelf and found, The How-To Herb Book This book comes from another time, I think. There are absolutely no illustrations, of any kind once you get past the cover, and I have to admit that page after page of black-and-white text coming at you can be daunting in this extremely visual age. Nevertheless, the determined reader will be well rewarded. And I was amazed to discover that despite being over 20 years old (publ 1991), it’s still in heavy enough demand today to be fairly pricey: a copy in good condition can easily command $30-$50 on Amazon. Notes: 1) Helps, say the authors, by increasing circulation within the brain. 2) Cayenne powder is HUGELY renowned in alternative medicine as an excellent healer, but it is also EXTREMELY potent and may cause upset stomach and diarrhea. 3) If you’re currently using a blood thinner, MAKE SURE to talk with a doctor before taking cayenne , as cayenne may compound the effects! NOTES: The authors actually recommend starting with all B vitamins in complex first, and then taking individual Bs as as symptoms indicate, so B-complex + B6 + Zinc for morning sickness. With most herbs, it takes about 90 days, or 3 months, of continuous usage to notice significant change. Hang in there or change your routine based on advice you trust. Again, even in the realm of alternative health, you need to seek out quality advice BEFORE you take anything. This happens more often than people think. Assuming you got advice from a quality health professional in the beginning, and there are no interactions, your body maybe ridding itself of built up toxins. I have good news for you: this cleansing you’re going through is often the first stage of the healing process. Categories: Friday Fun, Health & Wellness | Tags: alzheimers disease, morning sickness, natural remedies | Permalink. 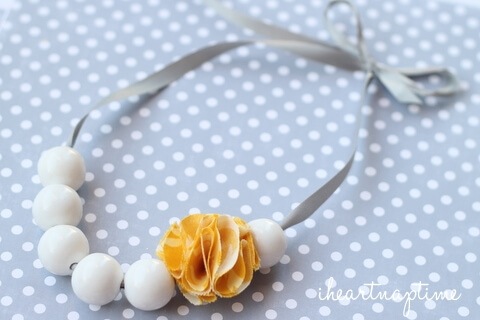 It’s been awhile since we’ve featured a kid’s craft here @ToL. Most of the crafts I’ve seen lately left me speechless in a ho-hum sort of way. My little nice, however, loves “neck-a-lesses”. (She just turned 3.) So, I can’t what to try these. As per usual, my timing is dreadful. I had just purchased 6 little necklaces to use as stocking stuffers from AVON. These, I am told, can be made for under $1. I spent just over $30–ouch! 1. Using a metal skewer or knitting needle, pierce one side of the gumball, gently working to the center. 2. Flip the gumball over and poke another hole directly opposite your first hole. WARNING: Resist the urge to try and poke a single hole straight through, from one side to the other, all at once. This is the surest way to break your gumball. 3. Use a doll needle to thread the ribbon through the gumballs. Thinner ribbon will be easiest to string. Tie a knot between each gumball as you string it. 1. Cut (6) 2- inch circles. Then fold each one in half. 2. Fold each circle in half again, creating a wedge or “pie” shape. 3. Tie a knot on the end of your strings and thread the needle through the corner of the “pie”. 4. Thread all the circles on the ribbon using step 3. You may need to turn the “pies” to create a full flower. Although it wouldn’t be nearly as pretty, you could also use plain elastic as your string. (Remember Smartie bracelets.) Cherry sours, lemon drops–any candy that comes in a solid ball (obviously, gooey centers are out) will make a fine bobble. String ’em up! Categories: Friday Fun, kids crafts | Tags: gumball necklaces, jewelry making, kid's crafts | Permalink. I have 2 words for this: simply gorgeous! I discovered this @Pip&Ebby a week too late–a week after serving my mom pound cake and berries for Mother’s Day, which don’t get me wrong, were delightful as strawberry shortcakes always are. But what you see here, this 7-layer ice cream cake, is a potluck, pitch-in, summer- event, show stopper! I can remember slicing strawberries last Sunday and thinking,”Yeah, this is gonna be good, but isn’t there anything else we can do with a pound cake?” Sadly, only blueberries came to mind, so I just kept slicing…Oh, well so much for luck! 1 pound cake, your recipe or check the bakery or frozen section (for Sara Lee) in your supermarket. **Omit sugar & cream if using cool whip, which is certainly fine to do if time is of the essence. 1) If using store bought cake, remove it from the metal pan it comes in. Line the pan with plastic wrap. Use enough wrap to cover the sides & top of the cake, too. 2) Using your serrated knife, slice the cake. But DON’T cut down through the top as you normally would to slice something. INSTEAD, cut the top 1/4 off lengthwise, working from front to back. Altogether, you should have 4 long slabs of pound cake. 3) Put the bottom layer of cake back in the wrap-lined pan. Now, using your rubber spatula, spread 1 cup of ice cream –you choose which flavor comes first– over that layer. Put down the next layer of cake. 4) Repeat steps 2 and 3 until you have used all of your ice cream. Then place the “top” back on the cake and cover tightly with wrap. 5) Freeze for at least one least one hour and up to 3 days. The cream & and sugar I called for can be whipped together into stiff peaks to create a frosting. Cool Whip is an even faster option. I even seen meringues used. They scare me, but to go that route you’ll want 2-3 egg whites, a pinch of cream of tartar, and 1/2 teaspoon or so of vanilla. Again, whipping until you have stiff glossy peaks. Also, I don’t see why you also couldn’t use a ganache or some type of Jello pudding. Experiment and see what you’ll like. Frost top and sides. IMPORTANT: Don’t get too matchy-matchy with your fillings and cake. What makes this so much fun is its eye-popping contrast! Looks Wonderful, but I Don’t Do Dairy! Categories: Friday Fun, recipes | Tags: DIY ice cream cakes, easy 7-layer ice cream cake, non-dairy ice cream cake, pound cake recipes | Permalink. 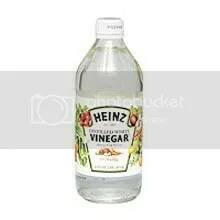 Ready mops are the rage right now, and making your own cleaning solution is much cheaper than buying the branded cleaning one. (This is one time the name-brand works best; generics tend to streak). Categories: Friday Fun, recipes | Tags: all-purpose floor cleaner, how to make your own swiffer solution | Permalink.